text and photos by Linda Conard. 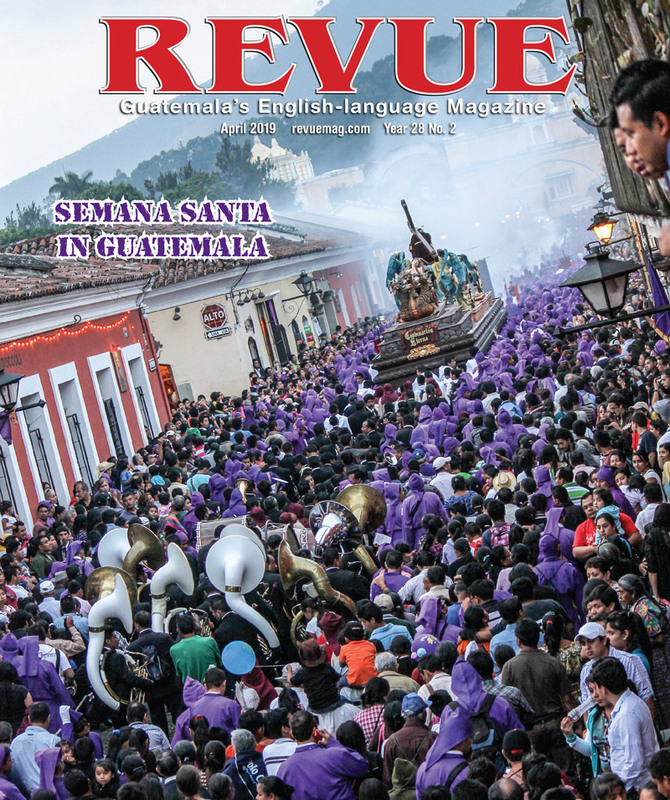 Many people dream of working from a home office in beautiful La Antigua Guatemala, but the reality isn’t always so dream-like. Telecommuters often deal with spotty Internet coverage, distractions, isolation and a “home” that starts to feel like “work.” Even working from local restaurants and cafés has its drawbacks. Michelle Berkowitz Sultan, founder of Social & Environmental Impact Consulting, found herself café-hopping between three or four places daily. “Every few hours I needed to change location because I didn’t want to be rude to the establishment,” she said, and buying something at each spot got expensive. Worse, working alone precludes the synergy of daily office conversations – those “aha!” moments when you run into a colleague has exactly the idea you need, or vice versa. 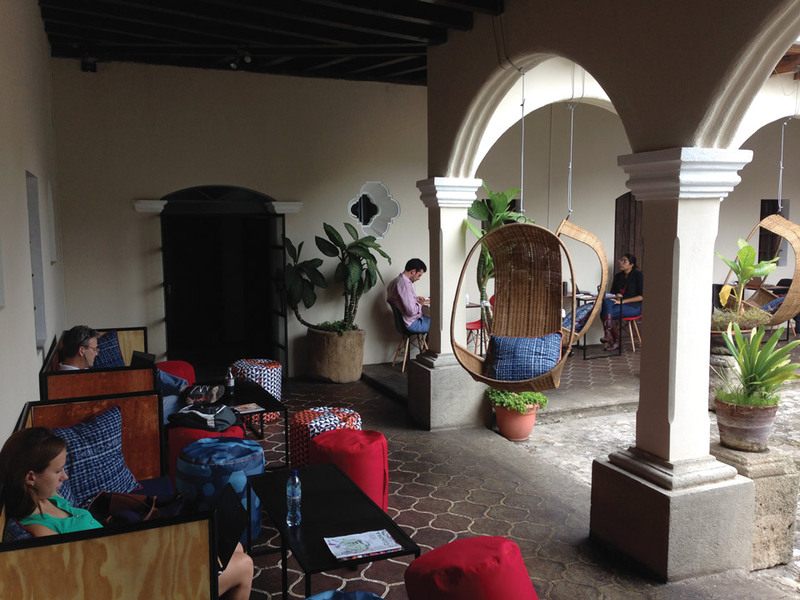 “A workspace that is collaborative, where you can share ideas with other people, bounce ideas off each other, and have the energy of a work environment—that’s really attractive to me,” said Chris Barry, program director for the U.S.-based Central America Health Initiative. 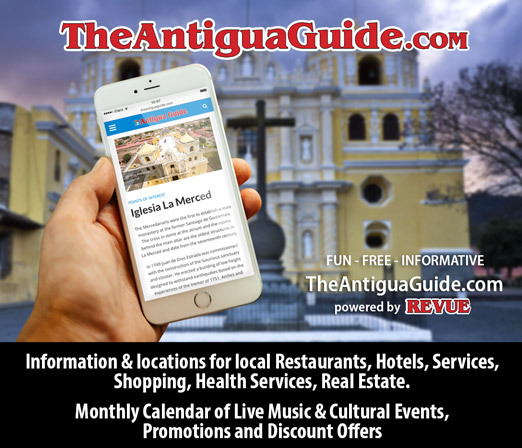 Creating opportunities for synergy and that “energy of a work environment” are two primary reasons that Richard Ambrose and Mark Jacobson, co-founders of the impact investment group Pomona Impact, created the new co-working space, Impact Hub Antigua (candidate). Co-working spaces allow telecommuters to save money by sharing office space, services and equipment. Impact Hub, started in London in 2005, takes it a big step further by creating co-working communities made up of professionals who promote sustainable impact. These may be social entrepreneurs and nongovernment organizations, as well as professionals in supportive roles like attorneys, accountants, graphic designers, copy editors and others. Internationally, Impact Hub now has more than 7,000 members in 54 Hub environments on six continents. Twenty additional locations, including Impact Hub Antigua, are candidates completing the approval process. 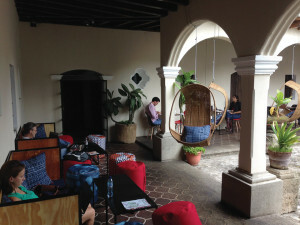 Antigua’s Impact Hub is in Casa de los Milagros, a Spanish colonial building on 1a avenida norte, across from La Fabrica gym. Everything in the Hub is designed to inspire networking and collaboration, while allowing for focused, independent work. Shared office spaces, large enough to hold up to 20 people per room, open onto a central courtyard surrounded by bamboo chair swings. Reliable 10MB Wi-Fi (the fastest speed currently available in Guatemala) is accessible from anywhere in the Hub, and members have free use of a large copier, printers, scanners and other office equipment. 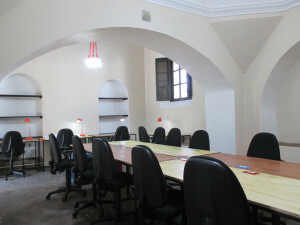 Rustic desks line the shared workspaces, and members can choose from office swivel chairs, beanbag seats and yoga balls. In addition to individual memberships, a small office of two to seven people might opt to rent a “Hublet,” where the team can work together in a more private, self-contained space. Members have free use of conference rooms, which nonmembers can also rent for meetings. The lunchroom and kitchen feature a fridge and microwave, plus unlimited free coffee, while an on-site café and juice bar will offer specialty coffees, smoothies and sandwiches. Excellent place for excellent business. If I wouldn’t have an office already, I would definitely go to work in such a Hub. Not just for the work space but also for the networking with other people like me. Or like you.